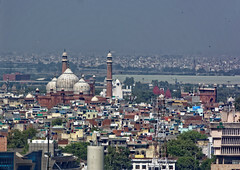 The best way to explore the Old Agra is by an Old Agra Private Walking Tour. Basically, it is a walking tour of our Great Mughal city of Agra that includes visits to Kinari Bazaar with jewel/utensils shops, textile shops, Jama Masjid (an old grand mosque), Ayurveda herbs and spice shops, and Indian sweets and snacks shops in Agra. You can stroll with the professional guide inside little-known bazaars of the city, where the old ways of life continue uninterrupted. You will be able to visit the streets are redolent of spices - turmeric, cinnamon, cardamom and more. This tour lasts for 2 hours and the departure time is between 9:00 AM to 6:00 PM.